For the past decade the Water District and its partners have been using reclaimed wastewater to save about 700,000 gallons of water a day that would otherwise have to come from the region’s water supply reservoirs. The effort has also converted hundreds of acres of completely barren and sterile bauxite tailings into stands of lush growth that attract a variety of local wildlife. The operation is a cooperative venture involving the Water District, the City of Aransas Pass, Reynolds Metals and the Sherwin Alumina Co. The Water District and Reynolds began discussion of possible reclaimed water projects in 1992. They looked at available treated effluent sources and methods of using treated wastewater to replace fresh water. 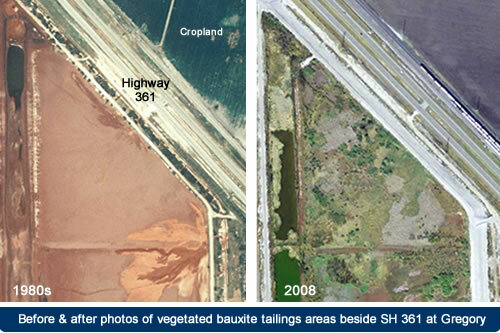 It appeared that the most productive reuse would be to place the reclaimed water on the bauxite tailings beds located along State Highway 361 just east of Gregory. Reynolds Metals started operating its plants in 1951, processing bauxite to extract alumina and reduce it to aluminum. The red dirt that remained at the end of the process was placed in large impoundments that covered more and more acres as the years passed. Conventional wisdom in the aluminum industry was that nothing would grow on the “red mud” tailings. Reynolds conducted a multi-year water reuse demonstration project and sponsored research by Texas A&M University at Kingsville scientists. They investigated what plants might be used, planting practices and possible soil amendments. The results of these tests were spectacular. With adequate water most plants did well and more sprang up from seeds delivered by birds and in stabilized biosolids. The $3 million project, completed in 2001, includes a pump station at the Aransas Pass wastewater treatment plant and an 8.8-mile 16-inch diameter PVC pipeline to deliver treated effluent to the Reynolds property. At planned times excess stabilized biosolids held in storage at the wastewater treatment plant are injected into the flow and delivered with the effluent to selected areas. Reynolds is responsible for spreading the effluent and biosolids on the desired portion of the tailings beds using a series of manifolds and irrigation pipes. 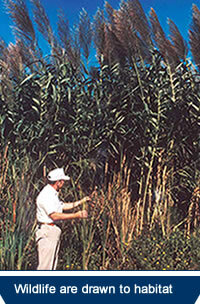 While some of the water is consumed in maintaining vegetative cover and dust control, most is “polished” as it moves through the vegetation and is eventually used by Sherwin Alumina as manufacturing process water. This recycling process allows the same water to be used three times – for municipal purposes, for irrigation and dust control, and for manufacturing. The diversion of wastewater also addressed the issue of nutrient enrichment of Redfish Bay because only a small portion of the effluent from the Aransas Pass treatment plant is now discharged into the bay. 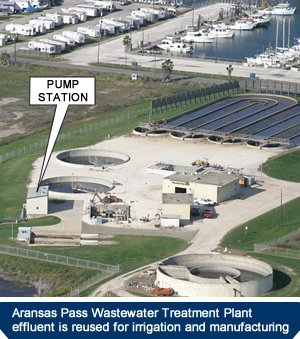 Added benefits for Aransas Pass are the reduced cost of biosolids disposal and reduced treatment costs. 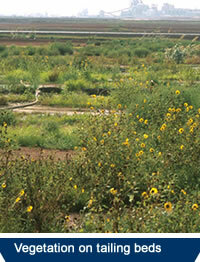 The system was built by the Water District with a loan from the Texas Water Development Board which joined with the Texas Commission on Environmental Quality (then TNRCC) in strongly endorsing the reclamation program. The Water District was awarded the first place 2000 Water Conservation and Reuse Award for small utilities in that year's statewide American Water Works Association competition. The Water District and local partners continue to investigate opportunities for using reclaimed wastewater from other municipal systems in reuse applications that continue to support regional industrial activity while decreasing the amount of fresh water diverted from the regional supply. �2019 San Patricio Municipal Water District. All Rights Reserved.